Kodi is one of the most popular media players around. As well as letting you access your own media files. If you are looking for the top boxes for Kodi, Amazon Fire TV can be one of your best choices. In addition, the Fire TV 2 also offers perfect 4K H.265 playback capability thanks to its dedicated H.265 capable hardware decoder. Then how about streaming H.265 video to Fire TV 2 via Kodi? From this information, we can see that the maximum frame rate that the new Fire TV 2 can handle is 30, if you try to stream a 4K H.265 video with a frame rate of 60, there will be dropped frames on the time. Here, you can easily fix the frame rate incompatible issue by downloading our best frame rate converter – Pavtube Video Converter Ultimate. The program has perfect importing support for the 4K 60p H.265 video downloaded from online sites or shot with 4K device recorders such as camera and specific iPhone models. Thanks to its batch conversion mode, you can load multiple 4K 60p H.265 video into the application for conversion at one time. With this powerful yet simple to use application, you can easily transcode 60p 4K H.265 video to Fire TV 2 perfectly working 30p 4K H.265 video with perfect quality and super-fast encoding speed. The program supports hard-ware encoding feature, you an get up to 30x faster H.265 codec encoding speed as long as you run the program on a computer with Maxwell (GM206) or Pascal based Graphic cards that supports Nvidia NVENC technology. To get better output video and audio quality, you can also flexibly adjust other output profile parameters including video codec, resolution, bit rate, audio codec, bit rate, sample rate, channels, etc as you like to get better output video and audio quality. 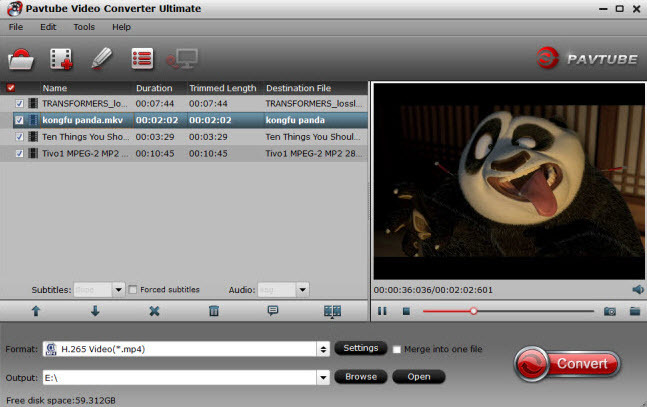 Pavtube Video Converter Ultimate is also accompanied by an up-to-date Mac version – Pavtube iMedia Converter for Mac. Hard-ware encoding acceleration is not available for the Mac version. Step 1: Load 4K 60p H.265 video. Download the free trial version of the program. Launch it on your computer. 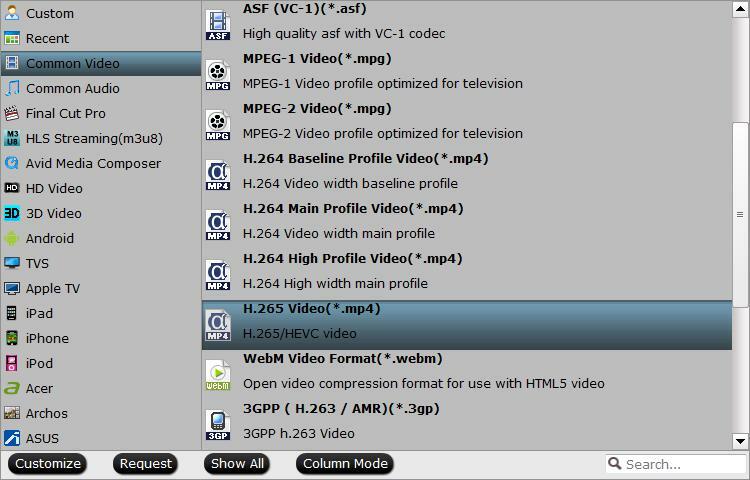 Click “File” menu and select “Add Video/Audio” or click the “Add Video” button on the top tool bar to import source 4K 60p H.265 video files into the program. Step 2：Define the output format. Clicking the Format bar, from its drop-down list, select Fire TV 2 supported 4K H.265 video by following “H.265 Video(*.mp4)” under “Common Video” main category. Step 3: Adjust output video frame rate to 30p. Click “Settings” on the main interface to open “Profile Settings” window, in video section, from “Frame Rate (fps)” drop-down list, choose “30″ as the compatible frame rate for the new Fire TV, you can also tweak other profile settings according to your own needs. After all setting is completed, hit the “Convert” button at the right bottom of the main interface to begin the conversion process from 4K 60p H.265 to Fire TV 2 native playback 4K 30p H.265 video. When the conversion is finished, click “Open Output Folder” icon on the main interface to open the folder with generated files. Add converted files to Kodi for streaming to TV via Fire TV 2.